The lack of rain hasn't bothered the plants as they benefit from drip-irrigation and their roots are protected by mulch. If anything, the humidity has plumped up the fruit a bit. 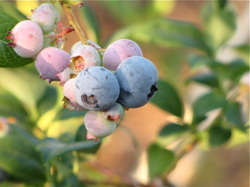 Everyone has commented on the size, beauty, and sweetness of the blueberries this season and we agree- they are beauties!